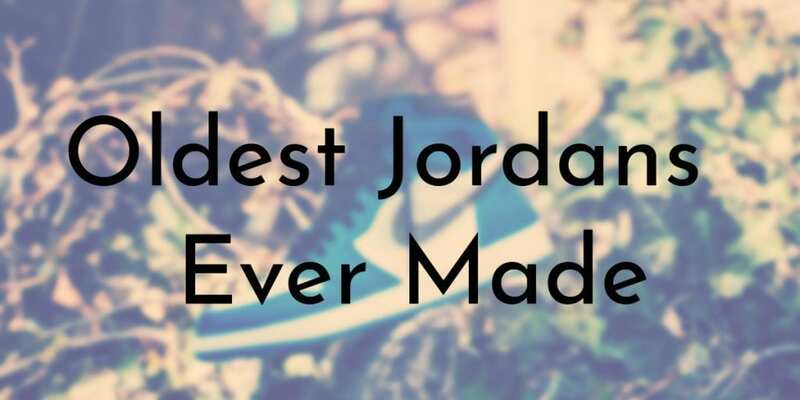 Air Jordans are some of the most popular shoes in the world and at their height they dominated the shoe market. The shoes have become so iconic that they transcend their original purpose as athletic shoes and have made a deep cultural impact. When Nike partnered with Michael Jordan in the mid-1980s to release the Air Jordan I, no one could predict just how influential the shoes would become. Air Jordans changed the shoe industry and birthed the sneaker collecting hobby. They became so popular that Nike never stopped making Air Jordans even when Jordan went through his first retirement from basketball. Now, over 30 years later, Nike has released 32 (not including variations) shoes in the Air Jordan line and continues to re-release the originals to new generations. The Air Jordan X was designed after Michael Jordan had left basketball and it was the first shoe in the line that Jordan had no input on. 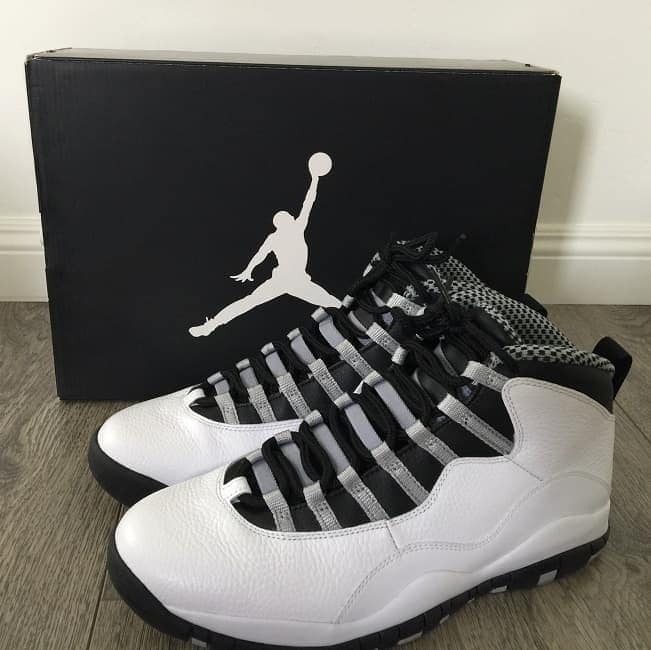 Tinker Hatfield did initially consult with Jordan during the first stages of development. Since Nike and Hatfield thought that the Air Jordan X might be the last in the line, the sole of shoes feature a list of Jordan’s accomplishments for every year he played in the NBA. MJ ended up returning to basketball in time to wear the Air Jordan X during the 1994 – 1995 season. His shoes featured his temporary number, 45, instead of his iconic 23. The first version of the Air Jordan X had an extra leather toe cap, which Jordan hated, so subsequent colorways had a clean toe instead. 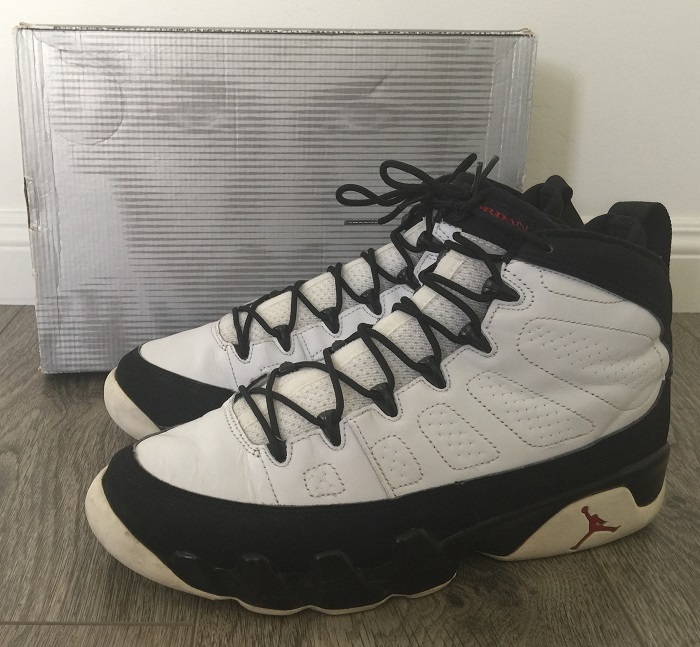 When the Air Jordan IX released in late 1993, Michael Jordan decided to retire (for the first time) from basketball and played a season of minor league baseball. Despite this, Nike decided to continue the Jordan line and Tinker Hatfield once again designed the latest iteration of Air Jordans. Hatfield wanted to take the line in a new direction and looked globally for inspiration. For the Air Jordan IX, Hatfield decided to focus on the outsole and used it to tell a story. Designer Mark Smith brought Hatfield’s idea to life and the AJ IX told the story of how basketball became a global game. Each shoe featured different phrases in different languages that captured how Michael Jordan lived his life on and off the court. Some of the phrases included: FRENCH – “DEDE”- DEDICATED; SPANISH – “FUERZA”- FORCE; SWAHILI – “UHURU” – INDEPENDENCE; and GERMAN – “ATHLETISCH” – ATHLETIC. 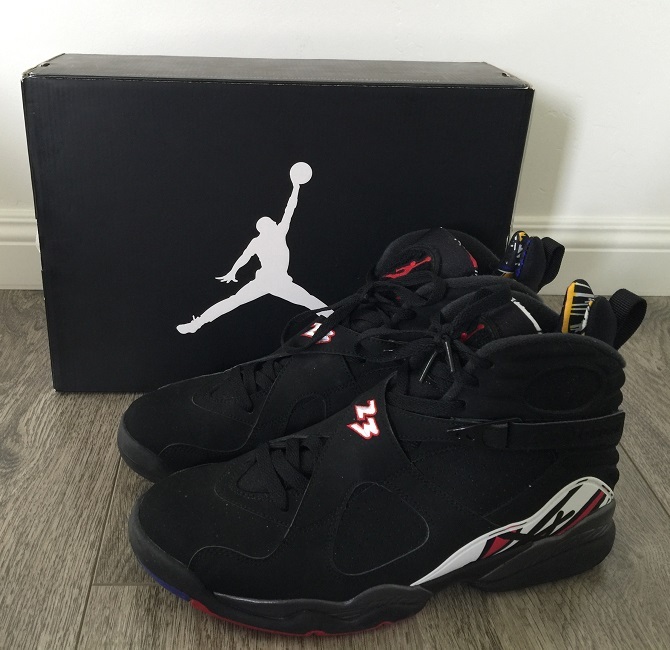 The Air Jordan VIII marked the true rise of Jordans as Nike finally allowed Tinker Hatfield to omit any Nike logos on the shoes – Hatfield believed that the Jordan brand was strong enough on its own. Prior to this, the Air Jordan II was the only other shoe in the line to not feature the Nike swoosh, which was considered a mistake at the time. After the release of the AJ VIII, Nike stopped putting its logo on shoes in the Jordan line. Hatfield also decided to go with a more colorful and heavier design for the Air Jordan VIII, which really captured the aesthetics of the 90s. The Air Jordan VIII was the first in the line to feature a polycarbonate torsion plate, a full length Air sole, durabuck uppers, anti-inversion cross-straps, and the inner sleeve of a Nike Huarache shoe. 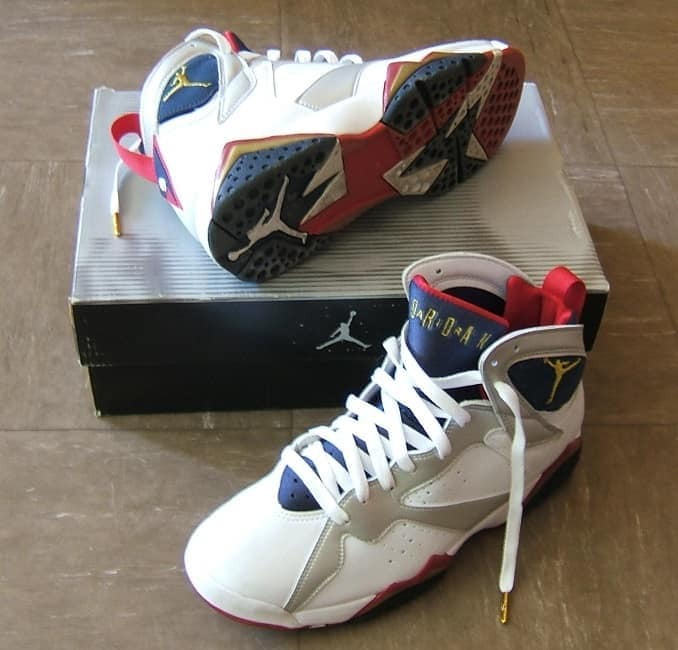 The Air Jordan VII was released during a time when Michael Jordan was enjoying several career highs, including winning the NBA championship again, being named MVP during the Finals and the regular season, and leading the USA Olympic Basketball Team to victory at the 1992 Summer Games. 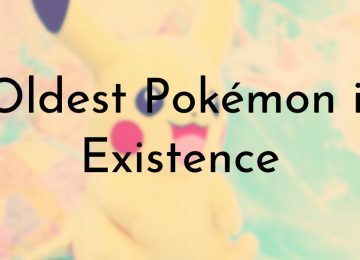 At this time, Nike decided to really distinguish the Jordan line as its own entity – the Air Jordan VII was the first shoe in the line to ditch the Nike Air logo and the visible Air window in the sole. To further separate the brand from the Nike Basketball line, the company starting marketing the Air Jordan line on its own. The Air Jordan VII is sometimes called the “Hare Jordan” because of the extremely successful 1992 ad campaign that featured Bugs Bunny. 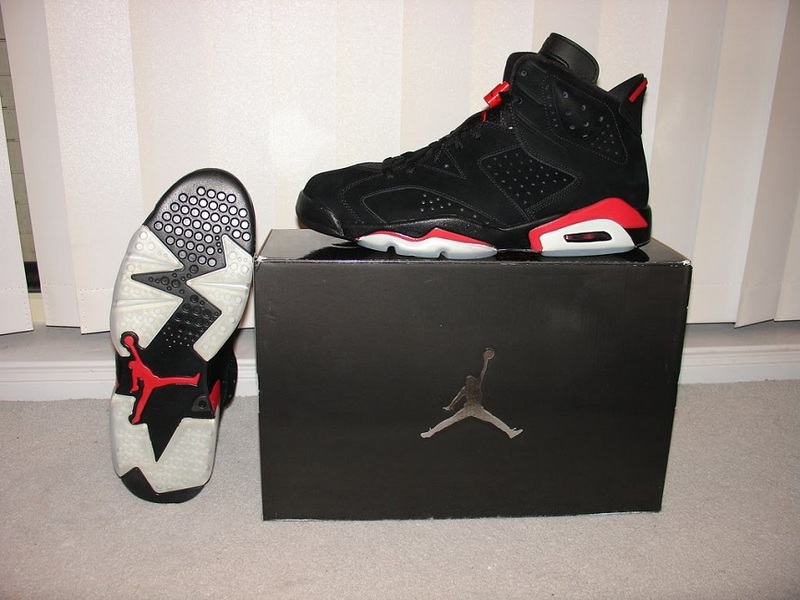 Although every shoe in the Jordan line has had some cultural impact, the Air Jordan VI will always be remembered as the shoes Michael Jordan wore when he won his first championship title. Tinker Hatfield was once again the mastermind behind the next shoe in the Nike’s Jordan line. For the AJ VI, Hatfield was inspired by Jordan’s German sportscar and wanted the shoe to convey speed and class. With the Air Jordan VI, Jordan specifically asked for a clean toe and Hatfield added a reinforcement around the toe for the first time. Jordan also told Hatfield that he had some trouble putting on the previous five shoes quickly, so Hatfield put two holes at the top of the tongue and a loop on the back of the shoe. With the Air Jordan V, Nike designer Tinker Hatfield continues to build up the mythical narrative surrounding Michal Jordan, who is playing better than ever during the 1989 – 1990 season. For the AJ V, Hatfield takes inspiration from a World War II fighter jet. These fighter jets were known for looking like sharks and Hatfield wanted to emulate that design in the Air Jordan V. What results is an intimidating and powerful looking shoe that reflects Jordan’s prowess on the court. 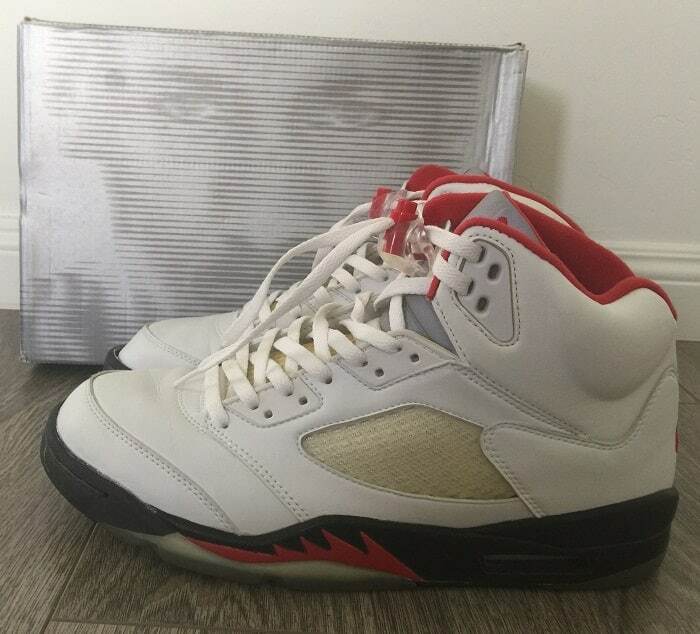 The Air Jordan V features some firsts for the line, including a bold tongue design that has a reflective 3M coating. This is also the first Jordan shoes to have see-through outsole, which is a really common design element in athletic shoes today. 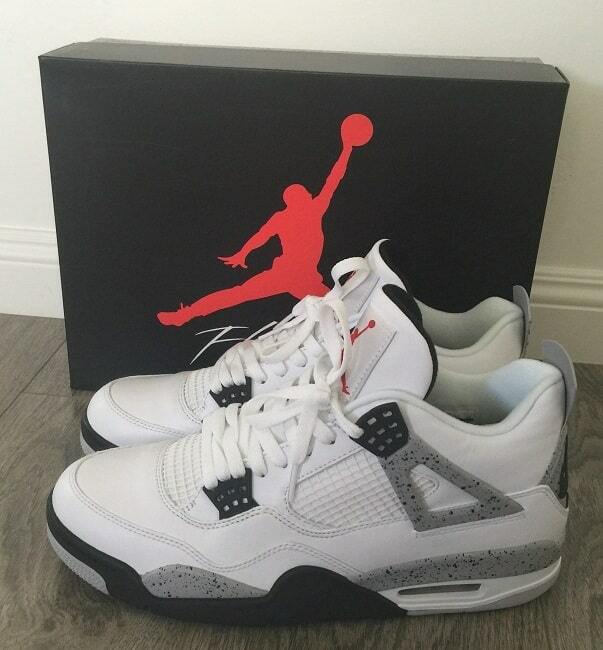 The Air Jordan IV was released in 1989 and is notable for being the first Jordans available to the global market. This time around, designer Tinker Hatfield was interested in a more utilitarian shoe. The design of the AJ IV emphasized breathability and Hatfield managed to make mesh, which was seen as cheap, into something stylish. The AJ IV was the first shoe in the line to feature “over-molded” mesh and the Nike Air logo. Famously, the Air Jordan IV played a memorable role in the Spike Lee film Do the Right Thing – the shoes in the movie had the never publicly released prototype design since Do the Right Thing was filmed in 1988. When the AJ IV was re-released for the first time in 1999, the Jumpman logo replaced the original Nike air logo and all subsequent releases also feature the Jumpman logo. 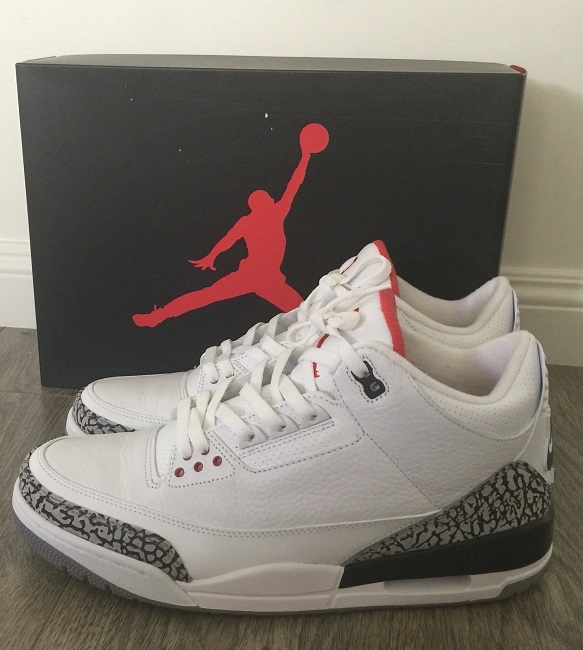 While the first two Air Jordan shoes were successful in terms of sales, the Air Jordan III is often considered the definitive shoe in the entire Jordan collection. The Air Jordan III was designed by Tinker Hatfield, who went on to design a majority of the Jordans and is credited with really cementing Air Jordans as a cultural icon. Hatfield is also responsible for keeping Michael Jordan interested in making more shoes. According to several sources, Jordan was not happy with the design of the Air Jordan II and was not interested in renewing his contract with Nike. However, Hatfield sat down with Jordan to figure what he really wanted out from his shoes. Hatfield listened and successfully married function and design to create the iconic Air Jordan III. The shoes were also the first to feature the Air Jordans’ signature Jumpman logo (a silhouette of Jordan touching the moon). Following the massive success of the Air Jordan I, Nike released a followup in 1986, the Air Jordan II, hoping to strike lightning twice. With the Air Jordan II, Nike decided to go in a completely different direction from the Air Jordan I. The AJ II featured a sleeker design, was made with faux lizard skin, and produced in Italy. The most unique thing about the Air Jordan II was that it was that they were the first Nike shoe to not have the brand’s signature swoosh. 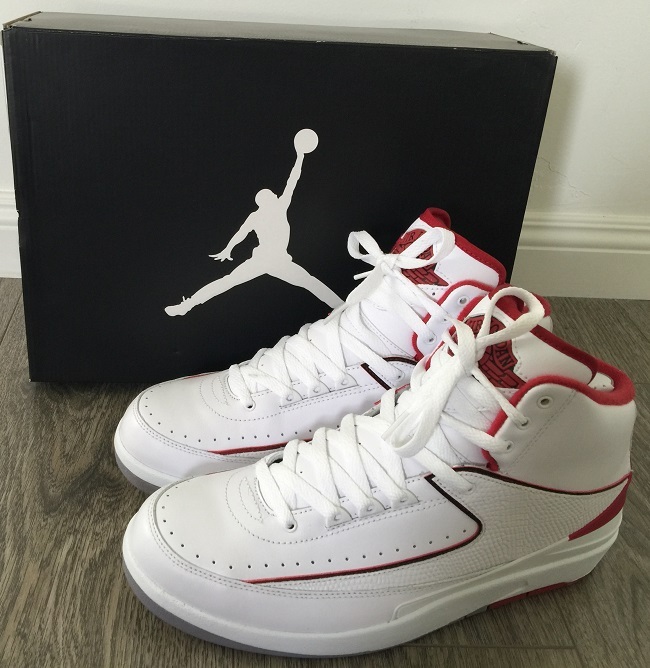 The Air Jordan II was popular off the court due to its high fashion design. Both the high top and low top versions of the Air Jordan II were worn on the show A Different World. Nike re-released the Air Jordan II for the first time in 1994 and most recently in 2018. 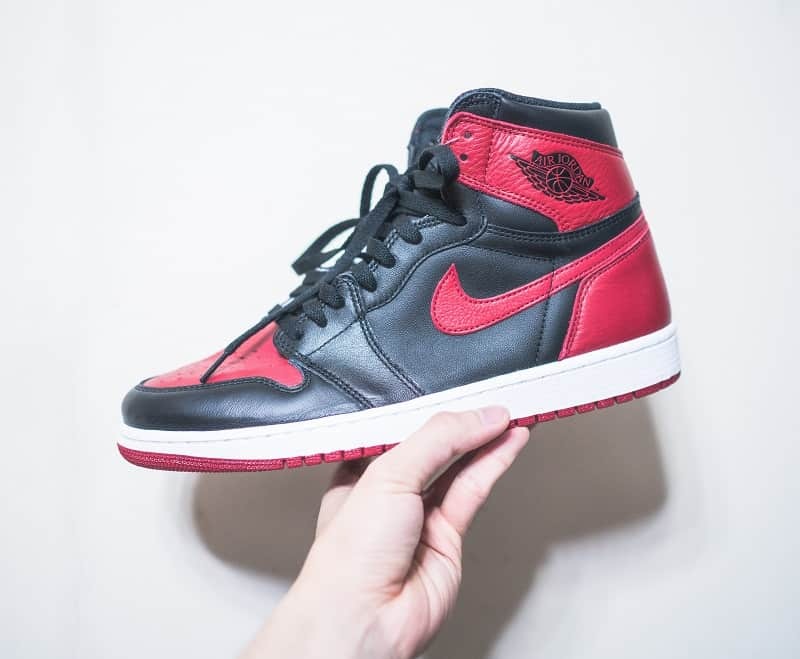 Despite the AJ II’s fancy design, the midsole was made with a rubber that’s not durable and most surviving originals have yellowed and cracked. The Nike Air Jordan I is the original and oldest pair of Jordans ever made. The shoes were initially made exclusively for Michael Jordan by Nike designer Peter Moore in 1984. The Air Jordan I was designed based on the input given by Jordan who wanted “something different, something exciting, and low to the ground.” Jordan also wanted the shoes to come in Chicago Bull colors, white/black/red – the Air Jordan I was the first multi-colored shoe to be worn in the NBA. Jordan debuted the Air Jordan I in 1984 and five months later, in April 1985, the shoes were released to the public. Prior to the April release, Nike and Jordan worked hard to advertise the Air Jordan I and their ads had worked. The Air Jordan I debuted to an over eager crowd and the first “sneakerheads” and shoe resellers were born.